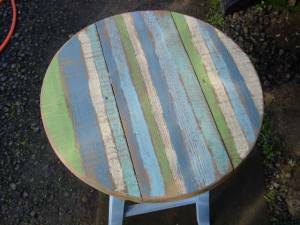 Your FAQ’s answered: What is your ‘weathered wood wash’? Where can I get it? Firstly I’d like to say that I feel like I am EXTREMELY GENEROUS with sharing tips and secrets that I have learned and discovered the HARD WAY. Especially so, since starting this blog. I show and tell how to do darn near every little thing I do! And I’m happy to share. God did not put me on this earth to just ‘do for myself’. Rather He has shown me that the REAL JOYS in life come from helping others along the way. Read about the above table HERE. THAT being said, there ARE a few ‘little secrets’ that I don’t just GIVE AWAY. I worked very hard all my life to raise a son on my own and have ‘taken care of myself’ since I was 12. And I plan to do so until I die! Taking care of myself (financially and physically!) became much more difficult in 2001, when a surgeon convinced me that my life would be better if I let him fuse my crooked spine. (LONG story!) That surgery has left me permanently disabled, and gradually getting less able-bodied as every year goes by. What does that have to do with my ‘wood wash’??? Well, since I may not be able to DO as much in the not so distant future, I started writing e-books, to sell at very nominal prices; so that I’d have SOMETHING to generate a little income when ‘the day comes’ that I can no longer make stuff and haul it to the craft show and antique mall to sell. I was saving my weathered wood wash recipe for just such an e-book then the key ingredient I bought to make it was discontinued. So it can’t be made anymore. I began searching for a ‘reasonable substitute’ and discovered Ralph Lauren Glaze, tobacco color. I actually like it BETTER then my old wood wash. It’ s more ‘flexible’ and can be used on surfaces my would wash could not. But I’ve heard it’s now been discontinued too! (it’s a conspiracy I tell ya!) I bought 3 quarts of it when it went on close out, so I’m SET for a while. But YOU wanted to know how to get the look I do with my wood wash, right??? Experiment a little and find your own favorite concoction! There are all kinds of antiquing glazes and stains out there. Even glaze bases that you can add your own color to! A ‘wash’ by definition’ is just watered down paint! Find a paint color that you like, water it down and brush it on and let it soak in. The DRAWBACK to the wash is that it will only really soak in into spots where it hits BARE WOOD. So it’s use is pretty limited. 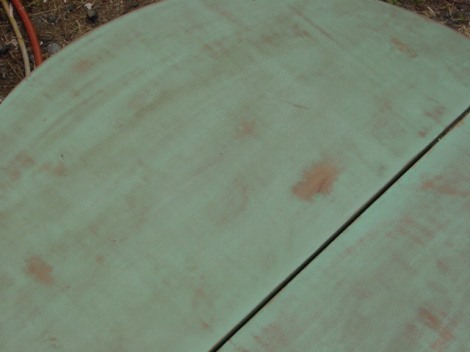 It will ‘float on the painted surface and dry’ , thereby darkening that part a bit too. But if you apply too much it will pool and spot. I hardly use it at all anymore, now that I am doing more shabby chic style and not folk art primitives anymore. 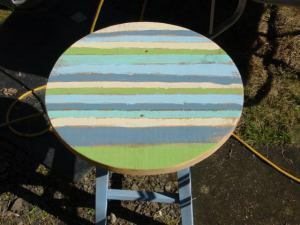 Take a scrap piece of wood, paint it, sand it, and start experimenting with stains and washes and find one that suits YOUR personal style, is my best advice on this matter. I’ve learned so much from your posts. Thanks for teaching us! And just looking at your work on your blog makes my day better because it looks so much more pretty than regular store-bought. I found your blog only fairly recently through Etsy and am thrilled with how generous you are with your “inside” secrets. I did buy an eBook from you on Etsy and think that is a great idea — so reasonably priced, quick and easy to get, and full of inspiration. Your blog itself is full of inspiration. Thanks so much for all you do and good luck on the health front — the eBooks and anything digital sure seem to be the upcoming thing, and I hope you continue in that vein for those of us who need to some spark to come up with ideas! I’ve been following your post for a little while now. Didn’t realize you had a botched back surgery. So sorry. I really enjoy your bog and look forward to every one! You truly have a gift for turning something beautiful out of old throwaway junk! I only wish I had half your talent.